When Apple launched iPhones without Home buttons, a whole new set of gestures were introduced, changing the way that we were used to interacting with our iPhones. To close an app on iPhone X, XS, XS Max, or XR, on iOS 11 you need to open up the App Switcher, press a finger on an app until the red "-" appears in the corner, and then tap that -- to close it. 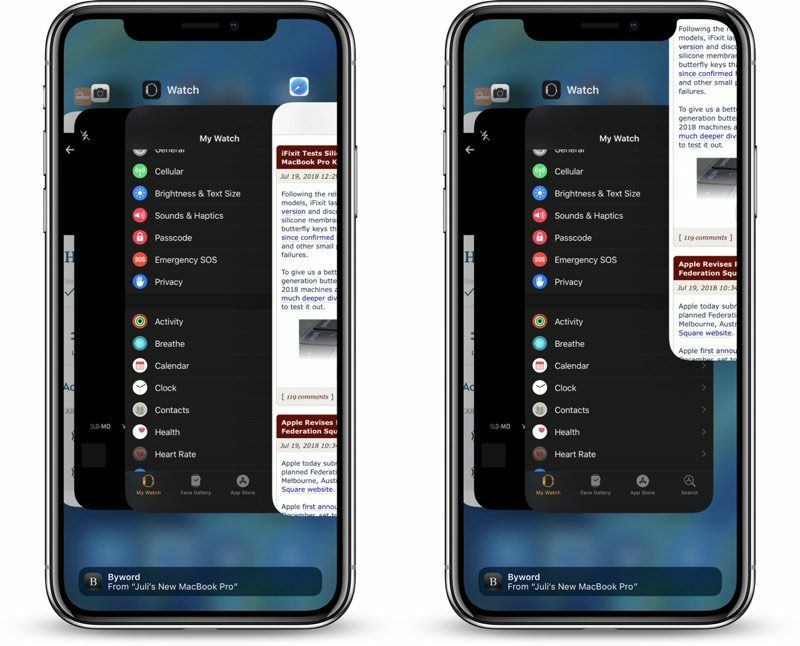 At the Home screen of the iPhone X, or while in an app, swipe up and hold from the bottom of the display. When the App Switcher comes up swipe through the different app cards to find the app that you want to close. Using this gesture exits out of an app and effectively closes it, which is useful if you need to restart an app for some reason. There's generally no need to close your apps to improve performance, though, as Apple has built-in management systems for dealing with all of the apps that you have open on your device. Most apps that are not active are in a suspended state and are not using up any resources, but some apps can run in the background for a period of time if background refresh is activated. According to Apple, force quitting an app will not improve your battery life, and it's possible that doing so can actually drain battery because it causes the iPhone to load it all over again. Apple has been saying that for years, but it doesn't change the fact that some apps (especially Facebook) are notorious for running in the background and draining your battery when (according to Apple press releases) they are supposed to be suspended. Killing the offending app is the only way to make it stop. And since you have no way of knowing which apps are good and which are bad, it's far easier to just kill them all when you're done with a session. iPhone X user here. It was never necessary to press the red minus. Once it appears, swiping up to close apps works as well. This just eliminates one step in between which is welcomed! Quitting apps used to be a thing which folks weren’t really aware off. As a somehow geek person, I used to advise people to do so. It became an act that showed that someone knew the logic of background activity draining battery performance, especially apps that were using GPS, or that were constantly connected to the internet to receive push updates. I am somehow sceptical about the text in the OP, since perhaps the OS is smarter att handling performance, but ... some principles must pertain with regards to battery performance and awareness of apps, with regards to being able to log your online presence or your location or whatnot. Can we take the statements above with a grain of salt, or do I really need to rethink my understanding on the matter? Edit: More documentation from Apple. Thanks for the references. I can conclude that my scepticism belongs to those threads instead. Nevertheless: users should use common sense and close apps as they feel for doing. The principle of the oposite being true (it would more drain your battery than preserve it) is a long shot. If you relaunch an app, you are intentionally adding load to the processor and therewith asking for battery power. I can never believe that the loss of power trough intentional processes would be higher than the gain of battery by not doing so for a good while. Off course, if you pick up the phone every minute, open an app and close it, it would not be so smart for battery life. My point being: we as a user should be fully entitled to close apps to our likings, as you never know what happens when they are lurking in the background. For macrumors to pertinently stress on a statement by Frederigi, is quite off the hook. Commons sense will prevail amongst us users. Of course, that's why the feature exists. You can close apps, and there are absolutely valid reasons to do. In the post, I'm just saying that you don't *need* to for reasons like preserving battery life because it is a common myth that if you don't close apps they're constantly running in the background or eating up too much memory. You absolutely do and can save battery by closing the apps that use background battery (aka, facebook and instagram among others, but those are the two worst offenders). They are 100% NOT in a frozen state and they 100% use resources. I'd argue that it's ultimately more efficient to turn off background refresh on these apps rather than to worry about closing them each time you use them. I have background refresh off for Facebook and some other apps that are notorious for using system resources. I don’t care what anyone says, I usually kill all the apps running each morning,pretty much from the day before and start clean..
Why keep apps running if they don’t need to be. Restarting the device, in my opinion, does much more towards system resource recovery than force closing all apps, with the added benefit of not losing the recently used order of apps in the switcher. I can agree with you on a per-app basis, I close certain offending apps such as YouTube and Safari, they both tend to hog RAM longer than they should. But I only close them if I don’t intend to reopen them for several hours. Why waste the battery life completely reopening all apps all the time? Uhm, that's not all that different than what I do now. It's not necessary in iOS 11, for example, to use the red minus (I don't get a red x ??) but just swipe up on the desired app to close it. Yes, I am. I'm using an iPhone X with iOS 11.4.1. On the iPhone X, swiping up just minimizes the app on ios11. To close it you have to hold it down until the red x appears and then click on it to close the app. The long list of suspended apps is a mess I don’t see. I just flick between the recently used ones which are always ordered to the front. I use it exactly as though there are only a handful of apps on it. It’s perfectly reasonable to want to close them but I can not be bothered since long ago. I’m from the early computer generation so this laziness did take some getting used to. I like the long tap to confirm before closing apps on the iPhone X and I’d rather they didn’t change it. But oh well, I guess it’s a very minor thing either way.